The Microsoft Azure Preview Portal automatically creates a pre-configured SharePoint Server 2013 farm for us. This can save you a lot of time when we need a basic or high-availability SharePoint farm for a development and testing environment. The basic SharePoint farm consists of three virtual machines in this configuration. We can use this farm configuration for a simplified setup for SharePoint app development or first-time evaluation of SharePoint 2013. The high-availability SharePoint farm consists of nine virtual machines in this configuration. 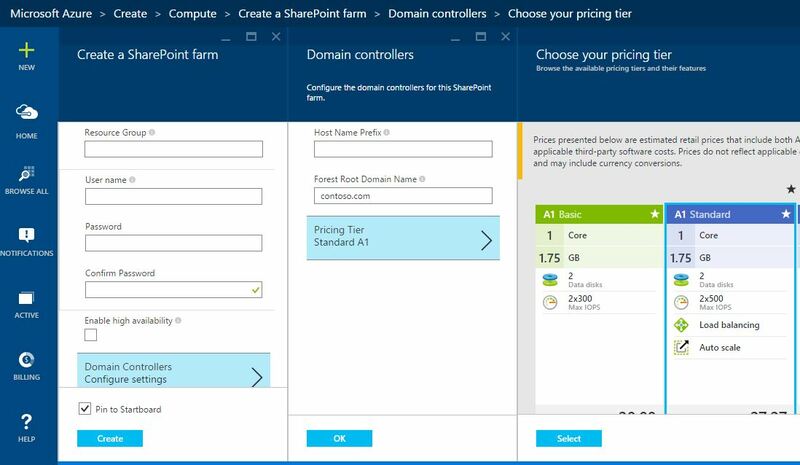 We can use this farm configuration to test higher client loads, high availability of the external SharePoint site, and SQL Server AlwaysOn for a SharePoint farm. We can also use this configuration for SharePoint app development in a high-availability environment. This entry was posted in Microsoft Azure, SharePoint 2013 and tagged Azure Infrastructure Services, SharePoint Farm.